The Amazing Kabob House invites you to try all we have to offer. We offer traditional Mediterranean cuisine with a fusion of flavors, inspired by the owners' ethnic roots. Family owned and operated, this jewel is located in the heart of Brea, nestled in the foothills of North Orange County. We specialize in Kabobs and are best known for our fresh, daily made Hummus dip and Tabbouleh salad among others. We are available to cater to corporate lunches and personal events. While ordering, don't forget about the naan, a specialty bread made fresh in a clay oven. See you there! Enthusiastic reception of the Amazing Kabob House's exceptional Mediterranean cuisine has propelled the successful brother and sister team of Kochai and Omar Farhad to a decision to franchise their popular restaurant. Originally established to offer traditonal Mediterranean food to the mainstream American market, this team rapidly discovered the wide-appeal of a healthy Afghan-influenced menu. What began as a healthy alternative to fast food in the city of Orange in March 2003, and opened in Brea in November 2005, has quickly become the popular place to enjoy this delicious selection of Afghan/Persian-influenced Mediterranean fare. Patrons travel from Riverside, Los Angeles, and San Berardino counties, as well as the local area, to enjoy this cuisine, which is offered at a very reasonable price. Besides being delicious, Amazing Kabob entrees cater to the growing trend of smart dining. With the increasing demand for nutritious, delicious, and calorie conscious food, along with the growing awareness of the health-value of a Mediterranean diet, dining out can now be healthy without sacrificing taste. With no added cheese or sugar, tasty menu items are satisfying for everyone -- vegetarians and meat lovers alike! Plenty low-carb choices are available, as well. "I love to see our customers' expressions when they try our food for the first time!" co-owner Kochai Farha recently stated. "The smiles we see when someone first tastes our food gives us great joy. We take great pride in our cooking, using traditional recipes an spices that abundantly satisfy everyone's expectations!" Appetizers are just the starting point of each feast, with fresh-baked naan (bread cooked in a clay oven- tandoor) served alone or as garlic flavor, with hummus, yogurt and cucumber, and baba ghannouj, kabobs (filet mignon, chicken, ground beef, seafood, and vegetable) and sandwiches served as wraps and stuffed pitas; soup and salads -- all offered in lunch or dinner-sized portions -- are guaranteed to satisfy the largest appetite. Child portions and a la carte options are also available. Best of all, the prices are reasonable! If you are only looking for a snack, you can order a portion of baklava, chocolate cake, or any of our assorted mousses with a coffee or latte to enjoy in our warm and inviting atmosphere. Orders can be placed over the phone and online. For more information and to view the whole menu, go to our website, www.amazingkabobhouse.com and www.myspace.com/amazingkabobhouse to view our television commercial debut! Hours are Mon-Thurs 10am to 9pm; Fri-Sat 11am to 10pm; Sun 12pm to 10pm. Franchising oppurtunities will soon be available, go to www.francorpconnect.com/amazin-kabob-house-franchise-information-9396.html . When Kochai Farhad was growing up in Kabul, Afghanistan in the 1950's she never imagined that one day she would be an ambassador of cuisine on the other side of the world! As a young girl, Kochai excelled in her studies. Pursuing her goal to make a difference in the world, she was educated as a teacher and taught high shcool physics and mathematics to ninth and tenth grade students for seven years in Kabul, before her big dreams took her to America. In May 1987, Kochai immigrated to the United States to join her family. "I am like someone who is always looking for treasure," Kochai says. "Just tell me that there is treasure, and I will not stop digging until I find it!" Kochai immediately enrolled in community college ESL and business classes, where she quickly learned English, and in 1993, became an American citizen. Her first venture was running a small retail business for ten years in Garden Grove. But, one day while having dinner together, Kochai and her brother Omar, a professional pilot in Orange County, both realized that they had an idea. They both envisioned a venture that would bring something special to their community. "My mother has always prepared the most mouth-watering and amazing food. We suddenly had renewed appreciation for the dishes that we had eaten together as a family. Omar and I talked about the fact that while many forms of fast food are easily available in theis country, they are often full of fat and additives that promote disease and health problems. The food we grew up eating was full of flavorful seasonings that made it possible not to use unhealthy fats --- we suddenly realized that we had something special we could offer." With a passion to share the culinary traditions of their heritage, Kochai sold her retail store and moved into an 800 square-foot location in the city of Orange, CA. She and her brother, with help from family (including Kochai's son, Joseph), developed a menu with recipes honed from her mother's family favorites, using no butter, cheese or sugar, only fresh ingredients and traditional Mediterranean spices for the savory marinades and sauces. Amazing Kabob House opened in the city of Orange in March 2003, only three months later. Originally established to offer traditional Mediterranean food to the mainstream American market, the wide-appeal of a healthy Afghan-influenced menu was enthusiastically received and became the place to enjoy a delicious selection of Afghan/Persian-influenced Mediterranean fare. Patrons travel from Riverside, Los Angeles, and San Bernardino counties, as well as the local area, to enjoy this unique and reasonably priced cuisine. 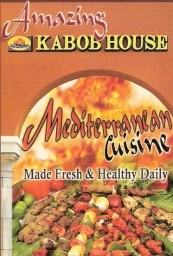 In November 2005, The Amazing Kabob House moved to Brea, and is now the first Mediterranean food franchise offered by Francorp, a leader in franchising opportunities. "I want to invite women to do what I have done," said Kochai. "There is nothing as satisfying as bringing appetizing food to people. It is so rewarding to have your own restaurant, and so gratifying to know you are providing people with food choices that are healthy and freshly made." "Women can make a difference in not just their own lives, in their communities, by owning their own business. It takes a lot of hard work, but nothing is impossible. Some of the most important times that people share together are over meals. We talk, celebrate, dicuss our days, and build relationships. Owning a restaurant is the perfect career for a woman who loves to nurture her own family. I encourage all women to explore this career. THer is nothing like it!" The Amazing Kabob House is currently growing and improving daily in their Brea location. But a lot more will be seen soon!